The term "Rim Latch" generally refers to latches that are surface mounted on the face of a door & that are normally operated by door knobs or ring handles. 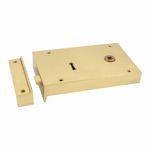 The high quality British made Rim Latches in this section are individually manufactured by skilled locksmiths in solid cast iron or brass with hand crafted brass & bronze internal components. Choose from a range of high quality finishes to perfectly compliment our Wealden Black Iron & Optimum British Brass door furniture. 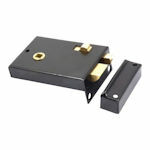 "Privacy Rim Locks" are surface mounted on the face of a door & incorporate a latchbolt normally operated by door knobs & a deadbolt normally operated by a simple slide action. 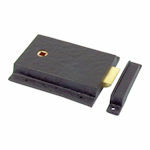 This type of Rim Lock is mainly used for simple, keyless locking of bathroom & toilet doors. Our black steel privacy rim locks offer an ideal solution for low cost applications while our decorative iron & cast brass locks are a good choice for period renovation projects. Our exceptional quality British made privacy rim locks are individually manufactured by skilled locksmiths in solid brass with hand crafted brass & phosphur bronze internal components. Choose from a range of high quality finishes to perfectly compliment our Optimum British Brass door knob furniture. "Rim Locks" are surface mounted on the face of a door & incorporate a latchbolt normally operated by door knobs & a deadbolt operated by key. 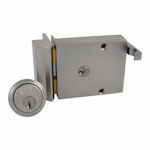 "Rim Deadlocks" have a deadbolt only operated by key. Our black steel rim locks offer an ideal solution for low cost applications while our decorative iron & cast brass locks are a good choice for period renovation projects. Our exceptional quality British made rim locks are individually manufactured by skilled locksmiths in solid brass with hand crafted brass & phosphur bronze internal components. Choose from a range of high quality finishes to perfectly compliment our Optimum British Brass door knob furniture. "Cylinder Rim Locks" are surface mounted on the internal face of a door & are operated externally by a separate cylinder lock barrel. Popular for house front entrance doors, our cylinder rim locks are available with a range of differing functions & security levels & include standard nightlatches, deadlocking nightlatches, automatic rim deadlocks, drawback locks & high security locks. Sourced from proven & trusted manufacturers, our Rim Locks have high quality & high performance features built in as standard. Select from Yale, Union, Legge & Ingersol patterns in all popular finishes & standard sizes.